Barney Martin worked at London Fashion Week on runway fashion shows for Fendi, Twenty8Twelve, Jaeger, Clements Ribeiro and Issa. Barney is a Pantene Expert Stylist. 3.To finish the look, tousle hair with your fingers and apply hairspray to give a textured but smooth look. "Sienna Miller's show again was a viewing, rather than a formal runway show and was held in a luxury mansion." - Barney Martin. 3. 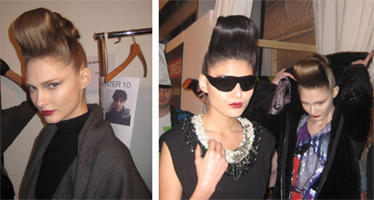 A jacket or hat was worn by each of the models and the hair organically loosened as the show wore on. "Jaeger was a traditional runway show at the strand, the official site. These are the type of shows I really love working on. The hair was worn tucked into jacket collars or under hats which were the main feature." - Barney Martin. The Clements Ribeiro was a viewing rather than a formal runway show - this seems to be happening a lot in London this year! 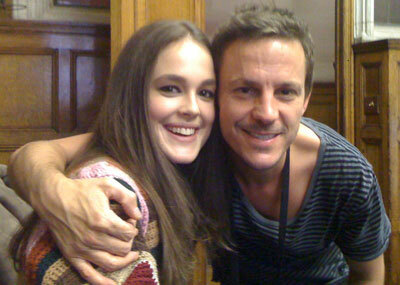 Barney Martin worked with international stylist Malcolm Edwards on the Issa show at London Fashion Week. "This hair was amazing, however it's a bit of a tough one to re-create at home and had more product used than I have ever seen!" - Barney Martin. How do you come up with your astonishing hair styles? Barney Martin: I really take my inspiration from the travelling I do to fashion week in Europe. It's not just the shows but also the street fashion. Every time I come back from a trip I am really inspired to create the new trends here and adapt them so they have a local edge. When do you decide how you will style the hair, is it when you see the model, outfit or before? Barney Martin: I like to see the whole package before I decide on the style. The length of a dress or neckline of a top can really impact whether your hair will look better up or down and also where the part line is. Your jewellery is also an important factor, with big earrings you will need to wear it off your face. Barney Martin: I had a really mixed experience with the models this year. You always have your mix of superstars and beginners. This year it was really noticeable that the brands saved the higher end models for the Milan and Paris shows. I also find that the more experience the model, the more relaxed they are about what you are doing to their hair. Sometimes the new models can tend to freak out at have their hair back combed. What is it like backstage prior to a fashion runway show? Barney Martin: Backstage at a runway show is chaos, no matter how much time you are given, it's always down to last 15 minutes before everything comes together. Final checks of the hair need to be done, and 9 times out of 10 when the girls change their outfits there is a disaster. 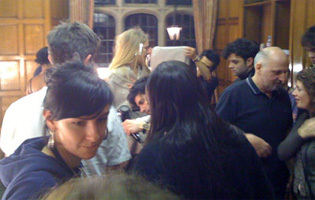 There is a team allocated to touch ups during the show as some outfits can be hard to get on and off. What is your overall favourite hair style? Barney Martin: My overall favourite hairstyle at the moment is inspired by the 50's rockabilly era. Quiffed fringes whether they are big or small. Also backcombed crowns with headbands were really popular on the streets of London. And long hair- everyone is growing out the bob. How can we easily style our hair for the office? 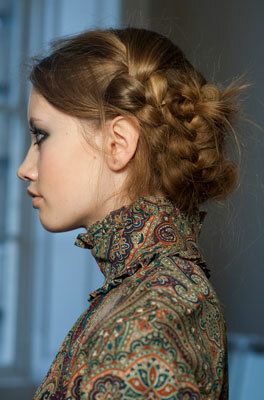 Barney Martin: There are a few options, but my favourite at the moment is braids. What hair styles will we see more of coming into Winter? Barney Martin: Block fringes are always really popular for winter. Big, thick fringes look best with long hair and long layers. Make sure you get the edges rounded as this will help to frame your face. Hair can really change the overall look of a model, how do you ensure the hair collates perfectly with the fashion? Barney Martin: It's all in the pre-production. The designer, the stylist, the make-up artist all have to be on the same page. What is your overall favourite hair product? Barney Martin: Treatments are my favourite hair product as they are essential to keep your hair healthy and shiny. If you have coloured or treated hair you should be using treatments at least once a week. In winter you should increase this to twice a week. Try the Pantene 3 Minute Miracle from Pantene. What is the best way to keep our hair in top shape? Barney Martin: Treatments are the best way to keep your hair in top shape. Women also tend to blow-dry their hair more often in Winter, try and have a heat free day once a week. You also need to have regular trims, if you have short hair every 4-6 weeks or for long hair every 6-8 weeks. How did you originally start hairdressing? Who inspired you? Barney Martin: My parents were both hairdressers and had a salon in London. I basically grew up in a salon! Do you prefer to use more or less product? Barney Martin: I always say less is more, if you want to get the most out of your blow-dry make sure you don't apply too much product.